When it comes to considering beauty products, it is much more than being skin deep — here we recommend our favourite planet-protecting skincare pioneers. In 2015, Barack Obama signed a bill banning microbeads from personal care products in the US. In 2016, the UK followed suit. Out of our hands and into the habitats of already endangered animals, the critical threat that these man-made polymers posed to marine life became a concern when Fendall and Sewell realised they slip through water filtering plants undetected, infecting almost as many fish as plastic bags and eventually ending up in our stomachs, too, when we eat them; did you know that the majority of babies are born ‘pre-polluted’? Since 2015, sustainable skincare has seen double-digit growth, and ethical, honest products pioneering the power of provenance and responsible production are now easily accessible, genuinely effective and beautifully packaged in recyclable vessels. Having been almost entirely disregarded in favour of brands promising miracle skin solutions, sustainable natural skincare now accounts for 13 per cent of the global beauty market. MOA | Independent, eco skincare experts MOA (Magic Organic Apothecary) has won numerous awards for their multi-purpose heavenly-scented products. Crammed with organic and natural goodness, they suit every skin type and smell invigorating. 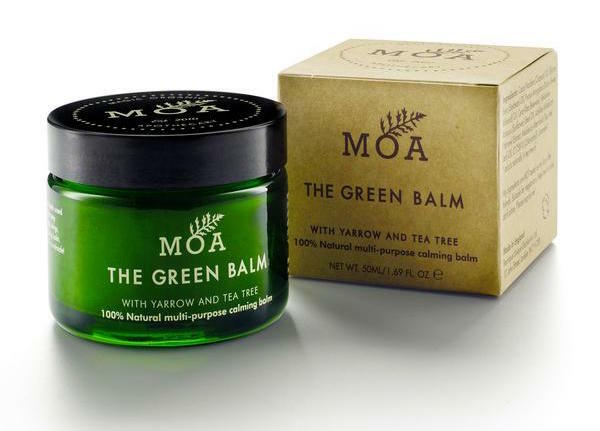 We love: The Green Balm, MOA's original product, is an organic healing balm, capable of solving every skin complaint under the sun. Ideal for sensitive skin, The Fortifying Green Bath Potion transforms any tub into your own transformational spa experience. FARMACY | This American beauty brand's eco credentials stretch much further than the supercharged ingredients they use. Product information is printed with soy ink on Forest Stewardship Council-certified paper, bottles are made with recycled and recyclable glass, not to mention the origami cardboard boxes they are sold in are printed on the inside with the brand's story. We love the Honey Potion. Bursting with antioxidants, this warming treatment mask transforms from syrup to cream when massaged into skin — stimulating blood flow and revitalising tired complexions with its radical-fighting Echinacea GreenEnvy, antibacterial propolis and healing honey. Bee Potion | From the hives of Hastings in Kent, Bee Potion combines their love of nature and the honey bee with skin enriching, anti-ageing oils to produce ethical, natural skincare. With the sales of their products, Katherine and husband Lee directly support vulnerable children by offering educational workshops. They also help protect both the environment and local and fair-trade hives. Tata Haper | For an authentically-artisanal experience try Tata Haper’s eponymous skincare brand. Focussing on sustainable production and the elimination of harsh synthetics the company’s EcoCert-certified products are formulated, batched, filled and shipped out of her Vermont farm. Not to mention they smell delicious and leave skin feeling squeaky clean. We love Tata's Clarifying Mask. Packed with plant-based, pollution-fighting ingredients this high-performance, this complexion clearing treatment is the ultimate weapon against imperfections and impurities, soothing and exfoliating all at once. Neal's Yard | Thirty years in the industry and accolades galore, Neal’s Yard Remedies became the first carbon-neutral high street retailer in 2008. Committed to protecting the environment, they support organic farming, sustainable wild-harvesting and fair trade programmes around the world. We love the best-selling, luxuriously rich Wild Rose Beauty Elixir. Packed with antioxidant-rich, organic wild rosehip oil, ultra-moisturising hyaluronic acid, skin brightening turmeric this serum boosts skin’s radiance and leaves it feeling silky smooth. Evolve Organic Beauty | Handcrafted in Hertfordshire in the UK, Evolve Organic Beauty's products are bursting with natural and organic oils. Small batches ensure freshness and all of their packaging is made from 75 per cent post-consumer-recycled bottles. Kypris | Beauty with soul, supported by science: holistic brand Kypris promises high-performance, sustainable skin care. All products are free from animal testing, parabens and artificial colouring, and most are grown in remote places and help developing economies. Not to mention, their packaging is beautiful. We love the Beauty Elixir I : 1000 Roses. The heady rose scent is genuinely transportive and the nourishing, nutrient-rich oils, distilled from more than 1000 Bulgarian petals, strengthen and soften all skin types. The Soap Co | Products at The Soap Co. are lovingly handcrafted by blind, disabled or otherwise disadvantaged individuals. Ingredients are raw and sourced locally, and beautifully-crafted, refillable bottles help to minimise waste packaging. We love the best-selling Black Poppy & Wild Fig set. Naturally rich and moisturising, use this and you’ll never have dry hands again. Nourish Skin | Reconciling technology and ecology, this vegan skincare brand created by Dr Pauline Hili leaves a light footprint on the planet while producing ethical, effective biodegradable products in London. Their advanced scientific bio-actives have achieved award-winning results and have been accredited by the UK’s leading organic certification body, the Social Association and also an endorsement from Cruelty Free International. As avid travellers, we love their Essential Renew Collection collection which comes in a brushed-cotton make-up bag and features three of their best-selling argan products: the cleanser, the peptide serum and anti-ageing skin rescue — all perfect for dry or irritated skin, which is ideal for time on long-haul flights.